Fully adjustable in height from 31" to 40". Supports Weight. Easy To Use. Well Constructed. Lightweight. As a registered nurse, I bought this cane for an aunt because of its light weight and durability. 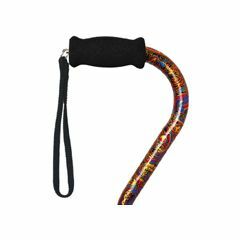 This cane is easy tu use and very secure. Don't let anyone catch you out of balance and out of fashion! I ordered this cane for my tall husband because it is supposed to extend to 40" it only goes to 39". When to Rite Aid and purchased one that truly does extend to 40"
Supports Weight. Stores Easily. Beautiful Paisleys. Safe. Easy To Use. Lightweight. Well Constructed. Beautiful Paisleys- I've had quite a few comments! The Best Cane, I have ever had! Lightweight. Supports Weight. Stores Easily. Safe. Easy To Use. Well Constructed. Short Distances. Indoors. Outdoors. Wet Weather. Long Distances. I suffer from extreme dizziness and have used this cane to win back some of the freedom I had prior to the onset of this illness.